Jane Addams, a pioneer in social reform, founded Hull House, the first settlement house in the United States, to serve the immigrant families who came to Chicago at the beginning of the industrial revolution. For nearly fifty years, Addams worked relentlessly for improved living and working conditions for America's urban poor, for women's suffrage, and for international Pacifism. Addams was the youngest of eight children born to John H. and Sarah Addams. Her mother died when she was two years old, and her teenage sisters, Mary, Martha, and Alice, took over her upbringing. Her family followed the Quaker faith, and valued hard work and change through peaceful efforts. Addams idolized her father, whom she described as a man of great integrity. He remained a pivotal figure in her life until his death in 1881. Addams's first exposure to urban poverty occurred when she was six years old, during a trip with her father to Freeport, Illinois. Upon seeing the city's garbage-filled streets and slum housing, she asked her father why the people lived in such horrid houses. After her father told her the people were too poor to have nicer homes, she announced that she would buy a big house when she was grown, where poor children could come and play whenever they liked. Addams suffered throughout her life from a painful curved spine that caused her to walk pigeon-toed. As a result, she was always self-conscious about her appearance. She was a good student and often helped classmates who were having difficulties with their studies. After graduating from high school in 1877, she attended nearby Rockford Female Seminary, one of the oldest institutions for female education in the area. Rockford encouraged its students to become missionaries, but Addams, who struggled with her religious beliefs all her life, refused to consider that vocation. While at Rockford, she met Ellen Gates Starr, who would later help her found Hull House. Reflecting Addams's emerging concern about the place of women in America, she and Starr attempted to convince the seminary to offer coursework equivalent to that of men's colleges. Eventually, the seminary did become Rockford College. Addams graduated from Rockford in 1881. Several months later, she was devastated when her father died of a ruptured appendix while on a family vacation in Wisconsin. His death left her a wealthy woman, and she decided to fulfill her plan to attend the Women's Medical College of Philadelphia. Addams began her studies that fall, but almost immediately the back pain she had suffered all her life flared up, forcing her to undergo back surgery. During her lengthy recovery, Addams toured Europe with her stepmother, Anna Haldeman Addams. Throughout her trip, Addams was struck by the poverty of the industrialized countries she visited. At a fruit and vegetable auction in London, she watched as starving men and women fought over decayed and bruised produce. As she wrote in her autobiography, her impression was of "myriads of hands, empty, pathetic, nerveless and workworn, … clutching forward for food that was already unfit to eat." She was also appalled at the lack of concern for poor people shown by better-off Europeans. On her return home in 1885, Addams found herself exhausted, depressed, and unsure of her life's purpose. On a second trip to Europe, she visited Toynbee Hall, an experimental Oxford-based project in London's poverty-stricken East End. Educated young men had moved into the area and were offering literacy classes, art lessons, and other activities to residents. Because the men actually settled in the area and lived with the residents, Toynbee was called a settlement house. "Private beneficence is totally inadequate to deal with the vast numbers of the city'S disinherited." Addams decided to use Toynbee as a model and establish a similar facility in the slums of Chicago. With over a million residents, that city was home to hundreds of thousands of immigrants—from Germany, Ireland, Sweden, Italy, Russia, Greece, and many other countries. These desperate people were a ready source of cheap labor for the Chicago factories, and their poor wages forced them to live in overcrowded, rat-infested tenements, surrounded by filthy, garbage-filled streets. Journalist Lincoln Steffens described the Chicago of that time as violent, foul smelling, and lawless. Addams enlisted the aid of her former schoolmate, Starr, in her new venture. The women first had to overcome the adamant objections of friends and relatives who were horrified that two educated, unmarried women would consider living in the city's slums. But Addams and Starr soon found a house where they could begin their work, the former mansion of Charles J. Hull. Once a stately country home, the house was now surrounded by rundown, noisy city tenements. In the beginning, Addams was able to rent only a few rooms in the house, but eventually, Hull's heir, Helen Culver, gave her the entire house and some surrounding land. After several months of cleaning and refurbishing, Addams and Starr opened Hull House in September 1889. Initially, the two were met with great suspicion by the area's residents. Local priests warned their parishioners the women might try to convert them to a new religion, and street children threw garbage and rocks at the house. But Addams and Starr continued to greet their neighbors in a friendly manner, and the residents soon discovered that the women were concerned about their well being. They also found that the women would sell them nourishing food for just a few pennies, and they soon came to depend on Hull House. In the first few years of the settlement house, Addams established a kindergarten, a women's boarding house, the nation's first public playground, and a day care center for mothers forced to leave their children alone for as long as ten hours each day in order to work. Hull House offered evening college extension courses, English and art classes, a theater group, and books and magazines for children and adults. Observing the long hours and dangerous working conditions that the neighborhood children were forced to endure, Addams and her friends soon began working for state regulation of child labor, and went on to lobby in Washington, D.C. At home, when city garbage collectors continually ignored overflowing garbage bins, Addams applied for and was appointed to the position of ward garbage inspector, and forced the trash collectors to remove the filth. Addams described her work at Hull House as an effort to conserve and push forward the best of the community's achievements. She strove to respect and preserve the immigrants' cultures, and the holidays of their various nations were always celebrated at Hull House. Among the volunteers who flocked to Hull House to work with Addams were several women who later brought about important social reform. Julia C. Lathrop helped establish Chicago's first juvenile court. Dr. Alice Hamilton worked in industrial medicine and conducted studies that helped improve factory conditions. Florence Kelley investigated sweatshops for the Illinois State Bureau of Labor and helped establish Child Labor Laws. Although Addams developed a wide circle of influential supporters because of her work, such as socialist eugene v. debs and journalist Steffens, she also occasionally lost admirers for the same reason. Addams never wavered in her belief that the same activities that caused her to lose some supporters would help her to gain others. 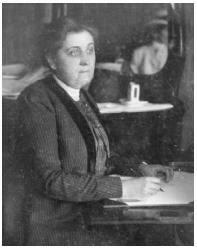 In the first decade of the twentieth century, Addams established herself as a prolific writer, publishing Democracy and Social Ethics (1902), Newer Ideals for Peace (1907), The Spirit of Youth and the City Streets (1909), and the best-selling first volume of her autobiography, Twenty Years at Hull House (1910). During these years, she began to turn her attention more and more to women's issues—particularly the right to vote. In 1913, seven years before the Nineteenth Amendment to the U.S. Constitution granted women the right to vote in all elections, she helped secure the vote for women in Chicago. Addams's work continued to expand beyond Hull House and Women's Rights. In 1909, she supported the founding of the National Association for the Advancement of Colored People (NAACP) and served on its executive committee. In 1915, she helped establish the Women's Peace Party, and traveled to Europe to attend the International Women's Peace Conference in the Netherlands and carry the message of peace to the countries fighting in World War I. Addams continued to hold to her pacifist views even when the United States entered the war in 1917, and she was blacklisted as a result. The Daughters of the American Revolution, a group that had once honored Addams for her colonial ancestry, expelled her, and she was shunned by many other supporters. She continued her humanitarian work during the war, however, helping the U.S. Department of Food Administration to distribute food to European allies. Following the war, Addams also worked to have food sent to the starving civilians in the defeated countries, setting off yet another round of criticism. In 1920, in response to increasing attempts to stifle unpopular opinion in the United States, Addams helped found the American Civil Liberties Union, dedicated to protecting the individual's right to believe, write, and speak whatever he or she chooses. By the 1930s, the public's bitterness toward Addams had abated. In 1931, she was awarded the Nobel Peace Prize, an achievement that Addams felt justified her pacifist work to the world. Frederick Stang, of the Nobel Committee in Norway, said Addams had clung to her idealism during a difficult time in which peace was overshadowed. Addams went on to receive fourteen honorary degrees, among them one from Yale, the first honorary degree that school had ever awarded to a woman. In 1930, Addams completed her autobiography with the publication of The Second Twenty Years at Hull House. A few years later, surgery revealed that Addams was suffering from advanced cancer. She died in May 1935. Shortly before her death, Addams was honored at an event marking the twentieth anniversary of the Women's International League for Peace and Freedom. In response to the many tributes she received, she said she was driven by the fear that she might give up too soon and fail to make the one effort that might save the world. Addams, Jane. 2002. Democracy and Social Ethics. Urbana: Univ. of Illinois Press. Davis, Allen Freeman. 2000. American Heroine: The Life and Legend of Jane Addams. Chicago, Ill.: Ivan Dee. Deegan, Mary Jo. 1988. Jane Addams and the Men of the Chicago School, 1892–1918, New Brunswick, N.J.: Transaction Books. Linn, James Weber. 2000. Jane Addams: A Biography. Urbana: Univ. of Illinois Press. Polikoff, Barbara Garland. 1999. With One Bold Act: The Story of Jane Addams. Chicago: Boswell Books. The Addams Family will run at the Wales Millennium Centre in Cardiff from August 1 to 12. But then it didn't come over here and there was puzzlement over that and I knew people were going 'when is Addams coming over here? E na confluencias destes movimentos que encontramos Jane Addams (1860-1935), que fez parte da primeira geracao de mulheres americanas a obter um diploma universitario, no seu caso, de Rockford College, no Illinois. Often compared and, even, confused with its CBS rival The Munsters, The Addams Family was the most wonderful and weird without a doubt. Two other members of the award selection committee, Susan Freiss and Jacqui Kolar, other supporters of books for children about peace and justice, as well as Paul Fry, only living pallbearer of Jane Addams, were in attendance. The petite star, who wed last October, first found fame at 11 years old when she starred as Wednesday Addams in 1991 film comedy The Addams Family. The two Worcester County students are not only preparing respectively for roles in Boston Children's Theatre's upcoming productions of the musicals "The Addams Family'' and "Fame,'' but also gaining training and insight with the acclaimed local company. NICE Swan Theatre Company will be one of the first in the UK to stage the musical version of the cult TV hit The Addams Family. NICE Swan Theatre Company will be one of the first in the UK to stage a musical version of TV cult hit The Addams Family - and it is looking for new recruits to join the family of macabre eccentrics. Gilman fue ponente en tres ocasiones, Addams en una, y Anna Garlin Spencer en otra mas (ver Publications of the ASA, 1908: v-vi). Two Shining Souls: Jane Addams, Leo Tolstoy, and the Quest for Global Peace.